As reported in narrowboatworld, a boat struck the gates of Lock 24 on Tuesday of last week, that were need of replacement, causing irreparable damage that immediately closed the entire flight. The boat and crew were unaffected. Gill Owen of British Waterways tells us that a British Waterways team is working to remove the old damaged gates, and fit new bespoke gates as soon as possible. At this stage 'we anticipate the lock flight reopening to the public on Friday 9th July'. Fortunately a pair of lock gates intended for another lock on the flight was being stored in water in the side ponds at the flight. This set of gates is close enough in size and dimensions to the affected lock, and after some alterations will be fitted to Lock 24. However the lock cannot be drained until a fish rescue is undertaken, which started yesterday (Tuesday 29th) and safety equipment is put in place. A crane too is needed to both remove the old gates and fit the new ones. The estimated cost is £45,000. 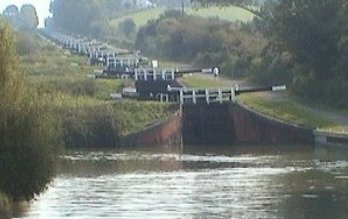 "The British Waterways team are working very hard to minimise disruption to boaters and other waterway users by completing the repair works as quickly and as safely as possible. By moving equipment and staff from other planned works we will be able to complete the job and get boats moving again. We have amended our works at other locations such as the Bath Flight to enable boaters to enjoy other sections of the canal. "This winter we have undertaken a number of lock gate replacements on the flight and our team will take the experience they gained from these works to enable them to complete the lock gate replacement at lock 24 in a swift and safe manner.